Nathan MacKinnon showed why he's one of the NHL's best players on Saturday. 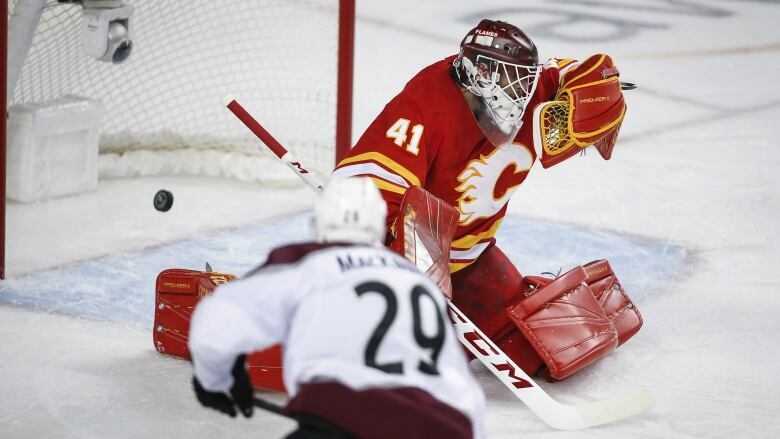 A force all night, MacKinnon scored 8:27 into overtime as the Colorado Avalanche tied their first-round series with the Calgary Flames at a game apiece with a 3-2 win. "Mikko and I tried to get ahead of their (forward) that was on me. I got a step and Mikko made a great pass. A little saucer pass," said MacKinnon. "I managed to get another step on that weak-side D to get a shot off and I put it where I wanted to." The snipe left his teammates, coach and even the opposition in awe. "The guy's a world-class player," said Smith. "If you give him too many open looks, he's going to find a way to get one past you, sooner or later. He ripped that one pretty good there. Obviously, you'd like to get a piece of it, but it is what it is." MacKinnon tied for the team lead in shots on goal with seven and he led both teams with 12 shot attempts. His 26:26 in ice time was third behind teammates Tyson Barrie (28:13) and Flames captain Mark Giordano (28:55), both defenceman. "I've said it before. Nate's a superstar and that's what superstars do," said linemate Gabriel Landeskog. Matt Nieto and J.T. Compher also scored for the Avalanche. Rasmus Andersson and Sean Monahan replied for the Flames. Avalanche coach Jared Bednar says his team could easily be down two games if it wasn't for Grubauer's performance. "First of all, (Grubauer) makes the save and it's a big save because of the time and the score and you're in overtime and he made a lot of big saves tonight, as did Smith, but to give us that save at that time... Then we get up the ice and (Rantanan) and (MacKinnon) execute unbelievably and we get the goal," said Bednar. In some late dramatics, Colorado tied it 2-2 at 17:21 of the third period on Compher's first career playoff goal, the result of some fortuitous bouncing of the puck. Rantanen's cross-ice pass banked off the skate of Landeskog, then off both skates of Flames defenceman Travis Hamonic, before Compher shovelled a backhand over a sprawled Smith. After winning a faceoff in the offensive zone, Monahan went to the front of the net. Johnny Gaudreau's initial shot didn't get through to the net, nor did Sam Bennett's shot attempt right after, but Monahan's third try went into the top corner, over the glove of Grubauer. "We have to be better. We have to be a lot harder to play against and we know that," said Giordano. "A tough way to lose, but there's these moments all the time in playoffs and you've got to deal with them and move on." The best Avs chance in the opening 20 minutes was Landeskog's breakaway off a TJ Brodie giveaway, in which Smith denied him when he tried to go five-hole. In the third period with the score 1-1, Smith stared down Landeskog again on a breakaway and again denied him, this time with a blocker save. Chants of "Smitty, Smitty, Smitty" were heard throughout the night from the crowd just like in the series opener. In a second period of momentum swings, Calgary tied it 1-1 at 12:26 on Andersson's first career playoff goal. The man advantage was the result of a Derick Brassard offensive zone tripping penalty, which came after a stretch of sustained pressure by the Avs in the Flames end. Nieto gave the Avs their first goal of the series when he stripped the puck from Brodie at Colorado's blueline and raced away on a breakaway, picking the top corner over Smith's glove. "We've always had the confidence in this room and tonight shows it," said Nieto. "Down late or running into a hot goalie, we know we can win games against this team. We're thrilled to be going back 1-1 and get back in front of that Pepsi Center crowd and try to get a lead in the series."